Since July 1, 2013, Senegal has introduced a visa requirement for EU citizens. The rules are as follows: You have to do a pre-enrollment ​​through the website of the Senegalese authorities: www.visasenegal.sn . A step by step description is available in the English and French language. After registration and payment of 52 euros is completed, you will receive a confirmation by email. Print it out and take it to an embassy or consulate of choice where visas are issued. For an address list of Senegalese embassies and consulates that issue visas, click here. It is also possible to buy the visa at the border crossing in Rosso, but I strongly recommend against that. The border post Diama doesn’t have the biometric system to issue visas. When choosing this border passage, a visa must have been prearranged. Perhaps an idea to do in Nouakchott or one of the embassies or consulates listed in Europe. Important change! Senegal scraps visa per 01/05/2015, see updates. At the time of writing this article, there is no single objective answer to the question if it is still possible to get the ‘Passavant the Circulation’ (temporary import document) for a vehicle over eight years old. Different messages on the overland travel forums are not conclusive. Check for the latest developements on the News|Updates|Overland page. 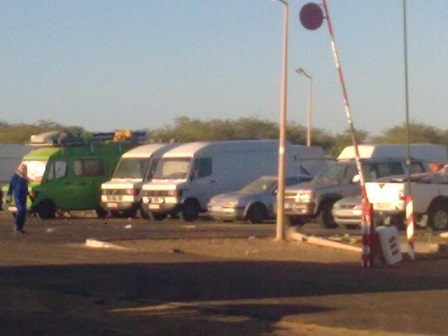 I have seen overlanders driving ‘overaged’ cars paying 400 euros at the Diama border crossing, up to 700 euros in Rosso, according to one witness account on internet. You run the risk being denied entry to Senegalese territory and getting stuck in the middle of the two countries. With a ‘single entry’ Mauritanian visa, you can’t return into Mauritania! This happened to one overlander who reports on the French voyageforum. Here you can see a picture of cars that had to be left at the border in Diama. Personally, I would not take the risk hence choose a younger car. This saves you the hassle and you’re no longer at the mercy of the customs on duty. Both border crossings are terrible with the difference that Rosso is often mentioned as the worst border crossing in West-Africa. Aggressive incidents with racist undertones at the Rosso border crossing are regularly reported. The border crossing at Diama is also corrupt, but a much quieter and relaxed place. Given that this situation has been going on for decades and even worsens, is suggesting that the Senegalese government pays little attention to intervene. That is unfortunate because many overlanders for these reasons abandon the overland journey. Having arrived in Diama, you have to cross a bridge before you meet the Senegalese customs and the police. During the day, they will ask you to pay 10 euros and even 20 euros after sunset (night tariff). Some say the correct amount to pay is 4000 CFA, about 6 euros. Around 8 o’clock in the morning the offices at the border open. First, go to the police in the building on the right side of the road. The officer on duty will write your name in a big book and ask for 10 or even 20 euros. This is not necessary and you should ask for an official receipt. It may take a while, but eventually, it turns out that there is no receipt (status 2013). As a rule, no receipt means no charge, with the exception to the ‘Passavant the Circulation’ (they simply never give receipt for). It has often worked for me although I must say, in Mauritania, a little less. Now go to the customs office on the other side of the road. Since you may have caused irritation over the 10 euros in the first office, it may happen that you must unload the entire car. This, in itself, is not a problem if you are not transporting contraband or goods that could be considered ‘commercial’. You can read about Senegalese customs regulations and restrictions at the Senegalese customs website here. If you do have a lot of valuables in your car, you are likely to pay a substantial amount of money or bribe. 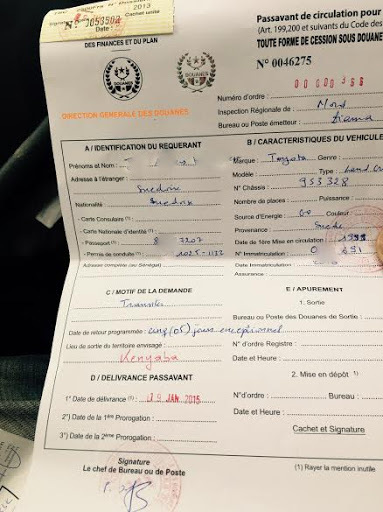 If your car is over eight years old, a very serious looking officer tells you that border passage is absolutely impossible by ‘presidential decree’ and contrary to the laws of Senegal. Nonchalantly mention the ‘Passavant the Circulation’ and add the word ‘exceptionnel’. Wait for the reaction and assess the full set of interests at stake. Don’t be surprised if all is not carved in stone, likely the officer will demand something about 250 euros up to 400 euros without receipt. The price is negotiable and I brought it once down to 75 euros. However, there is no guarantee. According to a recent report by Andrew Prior on the Sahara travel Forum, you pay 10 euros for a car less than eight years old to get the much-needed ‘Passavant the Circulation’. Warning! You may meet circumstances that you feel extreme frustration and anger. Avoid any use of foul language against an officer, if a situation escalates, you get the short end of the stick. Never give the impression you are in a hurry. When all customs formalities are completed the barrier will be opened. Now you need to buy a new car insurance for Senegal and The Gambia. Just behind the barrier on the left side is a bar run by Madame Diop. She sells car insurances and is very knowledgeable. If she herself is not present her business companion takes care. The price of the liability car insurance is determined by the fiscal CV rating of the car. Upon request, she will show you a list of the registration tax per cv (‘Puissance fiscale’). I used to pay about 50 euros for a minivan with 14 days coverage and extensions are possible. Do mention If your destination is The Gambia and verify that the insurance certificate is valid for all ECOWAS (CEDAO) countries. The roads in Senegal are generally amazingly good, but the traffic is chaotic. Be wary of stranded trucks in the middle of the road, suddenly crossing children, goats, dogs, donkeys and bad drivers in general. Driving through towns is usually pretty hectic. There are plenty of opportunities to refuel. Along the route to Gambia, you will pass several checkpoints. They are usually customs or sometimes police. Notorious is the police officer who stands just before entering the town of St. Louis. He even got his own waypoint coördinates on the Internet. Make sure you have all the stuff at hand, as described in Part 4 of this series. Tip! If you have an unoccupied seat in the car, give a ride to a hitchhiking soldier or police officer along the way. You will do a great service and the ‘official’ is your protection against his corrupt colleagues along the way. Further south, the quality of the roads is significantly less to very poor. I can be brief about it, absolutely inadvisable. 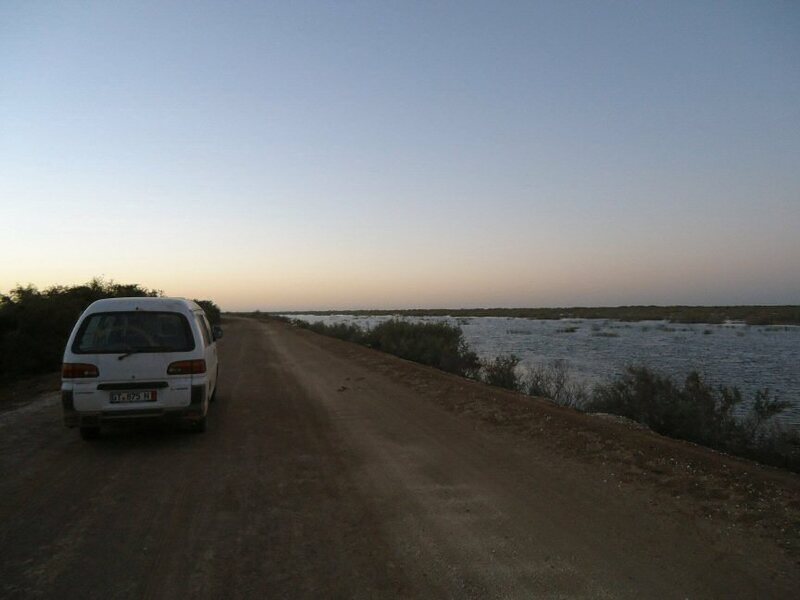 The most common route is via St. Louis, Louga, Touba, Diourbel, Kaolack to the Karang border crossing. The travel time overland is about 1 day depending on various circumstances. Special attention deserves the city of Touba: This is a holy city for Muslims and it is forbidden to smoke (not even in the car) and to drink alcohol. There are substantial penalties for violating these laws. The last 100 kilometres to The Gambia are characterised by extremely bad roads. The tracks next to the road are often better than the road itself. However, the scenery is fantastic. Having arrived at Karang, you drive until you reach the barrier. On the left side are office buildings where you can get the mandatory exit stamp from customs. They ask money, but this is negotiable. Several times I have paid nothing or a very small amount. You then go ahead to the police on the opposite side. There are a lot of money changers in this area. Tip! Do not change all your CFA into Gambian currency, keep 8000 CFA to pay for the ferry service in Barra. Eventhough onGambian soil, they somehow do not accept Gambian dalasis. How to go ahead in The Gambia will be discussed in the next part of this series.